Priced in Trinidad Dollars - For Caribbean Sales including Guyana Contact us. Analog and digital inputs for all your power amp needsA wide selection of inputs gives you the power and flexibility to get your signal where you need. Dual analog XLR inputs are perfect for taking a feed from an analog mixer and an AES/EBU input for digital mixer signals. Standard speakON and binding post output jacks are ready to connect to your favorite speakers. 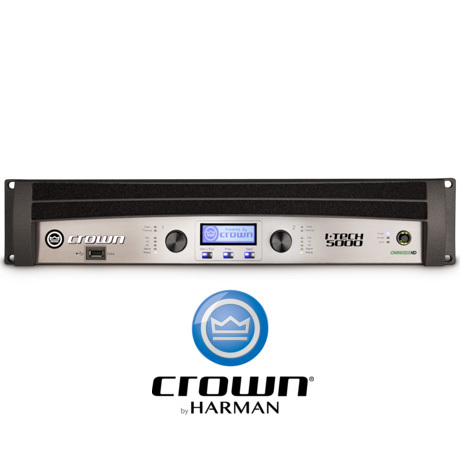 Network your amps together for a powerful arrayWhether you’re at a permanent-installation facility or on tour, the Crown I-T5000 HD power amp has the functionality you need. The built-in EtherCon Ethernet connector lets you take control of an entire network of amps and tweak them to your hearts content. Transfer presets via USB driveOnce you have your Crown I-T5000 HD power amp set up and presets dialed in, you can copy them to a USB drive, via the front-panel USB port, and transfer them to other I-Tech series amps. This saves you the time and hassle of having to set up each new amp to your perfect settings. Go high-tech with the Crown I-T5000HD power amplifier!